Inspirations from the Adventures of Superman comes in many forms. Every so often an e-mail will appear asking about various objects or props belonging to those of the Daily Planet's Editor-In-Chief, Perry White. Wonderful props are in abundance in Perry's office. Objects such as the dark eagle statue seen only in the 1951 season episodes is fascinating. Also is the television set (with the hideaway doors) Perry hammers vigorously on when the reception is lost during the final moments of Wayne Winchester's wrestling match with Bad Luck Branigan in No Holds Barred. The vertical panels beyond the couch give the office a distinct appearance of top floor significance. Most notable of all objects in Perry's office is the painting behind the desk. Often this object has evoked the inquisitive mind and more so, expressions of admiration. One question is, where is the original painting now? It is a question I have no answer for. Throughout the seven years of filming Perry's office changed slightly. However, the most disappointng of all props which did not remain beyond the first season was the eagle statue. It can be seen in partial in the image below. For the most part, the office remained virtually the same and the painting behind the desk was its stellar symbol. It suggested power and Perry White wielded much of it in Metropolis. While it is difficult to determine the colors hues of the B&W seasons, I suspect it's original tone is made up of various degrees of gray. 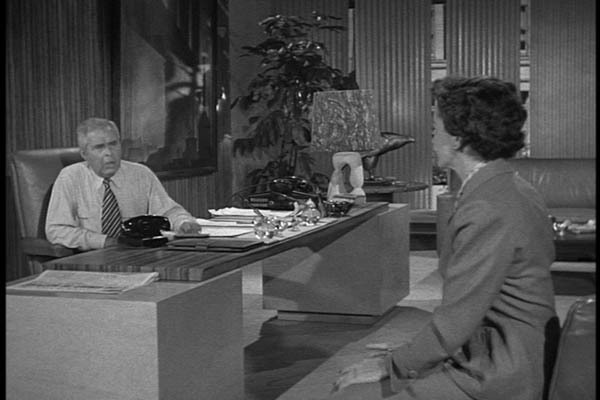 When the Adventures of Superman went through a set make-over for the color years beginning with the 1954 season, it does appear the painting also had color tones applied to it. Recently, an image of the Brooklyn Bridge appeared on Dave Shutz's Friendly Discussion Board. The message post had sort of a April Fool's Day (only it's August) feel to it and ended with an implied "if you believe this, I have a Brooklyn Bridge to sell you." The phrase is of course an age old expression. As I read the thread initiated by the multi-talented and long time friend to TAC, Steve Kirk, I had a very good chuckle knowing I was preparing this page. The painting shown below started as an inquiry from Skip Simpson (more about Skip below). 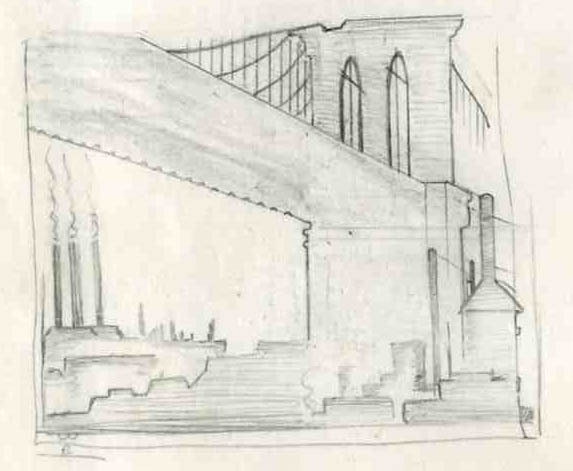 Skip wondered if a full image or video capture of the Brooklyn Bridge painting existed. Skip expressed interest in recreating the classic painting. To the best of my knowledge I recall no known scene for which the painting can be seen in its entirety. However, more than ten years ago I constructed my own sketch of the painting, which was tucked away in my collection hoping one day to see it realized in a more complete form. Skip realized he came to the right place and was thrilled to know I had a rough sketch already prepared. I was thrilled Skip thought it was worthy to use as a starting point. Not soon after, Skip was hard at work and within a couple of weeks he was able to complete the painting you see below. Skip Simpson has his studio in a rustic farmhouse in Alabama, which is fitting, as he paints scenes in acrylics, of local landscapes and rustic homes. He is semi-retired after spending many years working in the advertising industry as a graphic designer. He has sold many works including scenes of the Marjorie Kinnan Rawlings house in Cross Creek, Florida, the Hippodrome State Theatre and the historic DeCosta House, both in Gainesville, Florida. "Perry White's Painting" is a 24"x36" realization in acrylic on stetched canvas. The piece is a smaller version of the huge painting that hung in the gruff editor's office of The Daily Planet, seen on the "Adventures Of Superman" television series in the 50's. This painting is a result of memory and researching stills from the series on The Adventures Continue website and help from Mr. Lou Koza and Mr. Jim Nolt. Growing up, Simpson was thrilled with the exploits of the Man of Steel, and still remembers his young eyes drifting over to the painting during the office scenes, even if he couldn't quite figure out what was going on in the picture. To him, it either looked like construction workers building a city, or a steel mill. 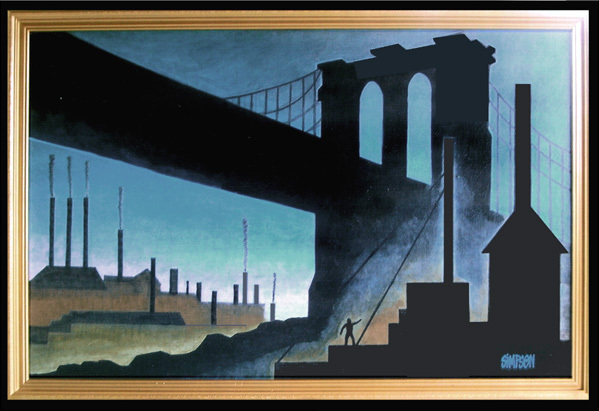 It was many years later when he realized it was the Brooklyn Bridge, done in a style that was very prevalent during the depression era. When built in the late 1800's the Brooklyn Bridge was a marvel to behold. A symbol of strength. Technology at its best. Up close today, the actual Brooklyn Bridge has lost none of its majestic appeal and is still magnificent to stand before or better yet, walk across. It is also a reminder of when the world was so much different. Those who stood with their eyes gazed westward from the Brooklyn side, across the East River to Manhattan embarked on a future of amazing wonders yet to follow. Today, the bridge is still an inspiration to those who appreciate its history. 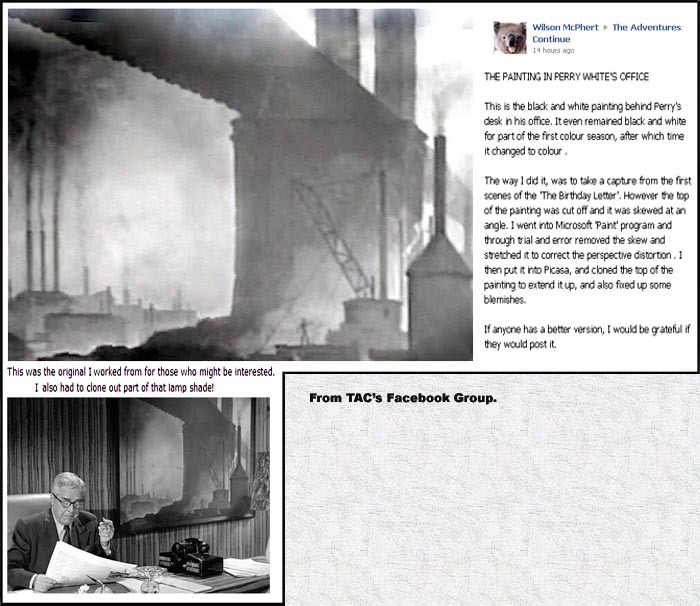 The image below is from Wilson McPhert - Facebook - November 4, 2012.